With BioBLAST® the NASA-sponsored Classroom of the Future introduced students to one of the first interactive tools putting to action the biology lessons students were learning in the classroom. In this award-winning CD-ROM students used their human and plant biology know-how to become "space farmers" of sorts. Their goal was to design and test a model for a life support system that was plant based. These plants had to sustain a crew of six for three years. 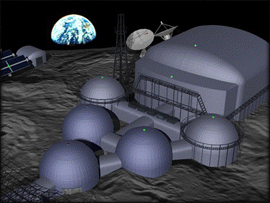 To test their system students entered a virtual research facility on the Moon. There they manipulated simulators and online resources that provided all the information they needed to produce the kind of space farm that would meet the mission's goals. Based on NASA's advanced life support research, BioBLAST featured more than 150 documents and another 150 QuickTime movies and images along with many other interactive components. Some components of BioBLAST are now incorporated into the BLiSS Sim iPad app the Classroom of the Future has created for NASA.